← Contradictions in the Hadith: Evil Omens? Bible Contradictions #36: Does everyone have to die? Death is an absolute. There’s nothing we can do to stop our march towards the grave. What happens after that is unknown (and therefore not worthy of debate). But when we look to the bible we see an apparent uncertainty that would baffle the mind of any reasonable person. What the bible means (by way of interpretations) and what the bible says are two different things. Verses claiming that everyone will die are often interpreted as meaning everyone will have a physical death. Those verses can be found at Romans 5:12 and Hebrews 9:27. Of course everyone will have a physical death (except for Enoch, whose physical body was taken to heaven, so he alone can contradict these two verses, but I’ll focus elsewhere for now). Then we have the other verses about death. John 8:51, John 11:26, Hebrews 7:1-3, and Hebrews 11:5 show us that not everyone will see death. Indeed, one king from thousands of years ago is still alive and walking around the earth. These verses are interpreted as dealing more with spirituality than physicality. This is what the apologists will tell you. Of course, they can’t prove it because the bible doesn’t explain death in any terms other than the physical. But besides, the ancient king and Enoch had no physical death. Even if we agree that John is about spiritual death and not physical death, what about the verses in Hebrews and Genesis? There is no way to interpret those as physical deaths because one man had his physical body taken to heaven, and the other man is still alive. In other words, this contradiction is actually several contradictions in one. This entry was posted in Atheism, Bible Contradictions and tagged Atheism, atheist, Bible Contradictions, Christianity, Christians, contradictions in the bible, God, Religion, the bible. Bookmark the permalink. 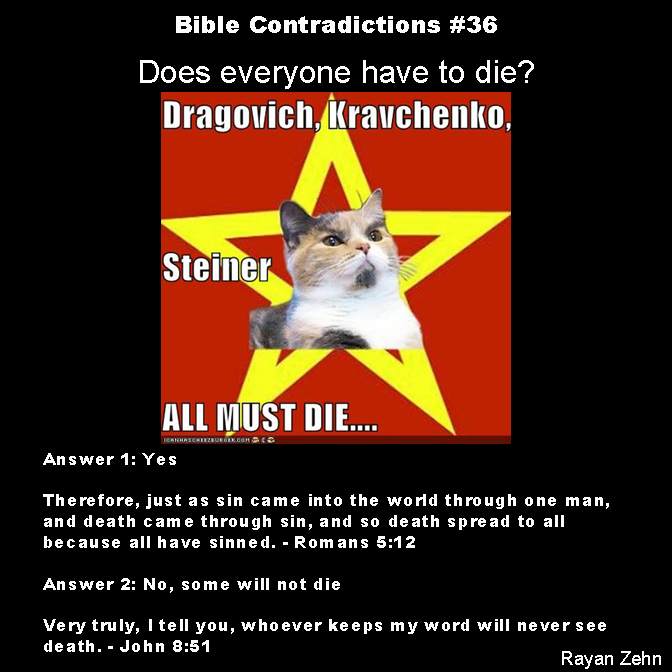 7 Responses to Bible Contradictions #36: Does everyone have to die? John 8:51 is why Jesus is called the Savior. These posts continue to display a total ignorance of the Bible and make atheists look like a bunch of dunderheads. If you say so. I think reading my posts instead of the pictures might help your arguments. Oh, he can read it. It’s just that he refuses to understand its lies. When faced with those contradictions, do you always bury your head in the sand? Fine article, Mr Zehn. Well done.